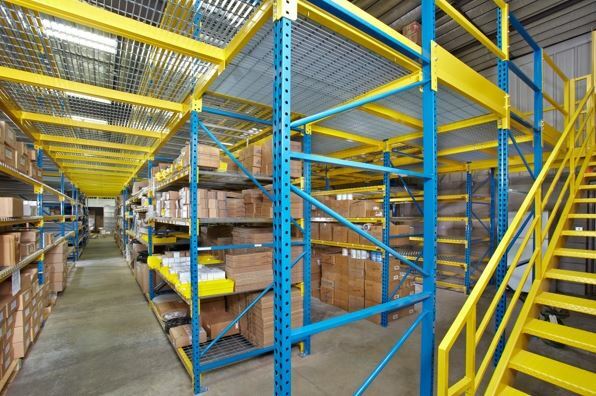 When you must move a pallet or carton from the floor to a mezzanine, or to another floor, what are your options? 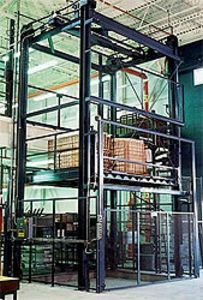 Vertical reciprocating conveyors, (VRC’s) are often called mezzanine or vertical lifts because that’s a frequent application. VRC’s occupy a relatively small footprint – ranging from 3’ x 3’ to 30’ x 30’ for standard sizes (and the flexibility to configure just about any necessary size). They’re fast to lift, so bottlenecks aren’t created in the process. They are also low-maintenance, with a low cost of operation. Their diversity in sizes means that you can specify a VRC that can lift about anything – a car, a fully-loaded pallet, a container – in weight ranges that can exceed ten thousand pounds. You can select mechanical, hydraulic, or fully automated models. These vertical lifts can also span multiple levels, unlike some of the other options. You can have stops on two, three, or more levels of a multi-level mezzanine or pick module. You can increase versatility by utilizing different platform types, ranging from flat metal decks to power conveyor rollers that can merge with your system. VRC’s are a space-saver vs. other options. They essentially occupy just the needed footprint to handle the product, with the average system requiring a footprint of just 3’ x 4’. The typical VRC pushes five cycles a minute, which is less than a vertical conveyor or a spiral conveyor. See our guide to VRC specification for extensive information on your options. In terms of expense, VRC’s are on the high range of vertical movement options. A spiral conveyor is another viable option. 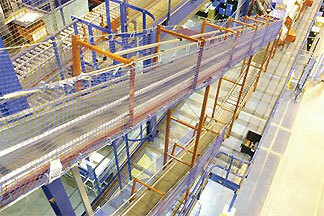 Like VRC’s, spiral conveyors help recoup space, although the typical spiral commands more space than a VRC. They’re available to convey unit and carton loads but are typically utilized for cartons/totes. For very high throughput carton or tote conveying applications, spirals are exceptional. We have utilized them in snack food applications where space was tight and high rates of throughput were needed to deliver cartons from suspended belt conveyor systems. The chief advantage is that the spiral conveyor is probably the fastest of these options. Multiple cartons are always packed into the conveyor, where an incline can only do a few (based on capacity rating and spacing) and a VRC typically just one. Gravity chutes are utilized to move product down, but not up. They’re inexpensive for the right application profile and require little to no maintenance once installed. They are ideal for a material flow design that processes something on an elevated platform and feeds it to a lower level for transport or further work. Incline conveyors are the least costly of these options, but they are space hogs. But in the right application, the impact of lost space can be minimized. Most incline conveyor projects are going to have a maximum 30-degree incline angle. They’re excellent for cartons or cases. Different belt styles (flat, cleated, roller bed) are available for various types of loads. 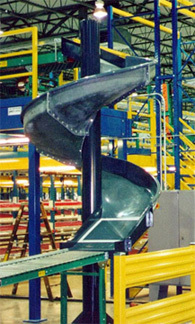 Slider bed incline conveyors have a sheet metal frame with pulleys at either end. Compared to a roller bed incline, stopping a loaded slider bed may not shift product backwards as much due to friction between the belt and bed. Maximum load per linear ft: 100 pounds. Roller beds carry a more robust 225 pounds. Most inclines carry total capacities that can meet your throughput requirements. In most every operation, this has been done at one point or another. It’s simple and it works–but it’s slow and labor intensive. It can also be more dangerous, since someone will have to stand atop a mezzanine to guide and unload products from the suspended pallet. By nature, it also means that you will have an unguarded platform at least some of the time, opening you up to one of the most common types of industrial accidents–the fall. Since this method ties up at least two people, it creates material flow bottlenecks. But if you have the people and the forklift in place, it’s “free.” It’s just going to cause bottlenecks. If it is a repeated operation, consider implementing something that is more permanent, efficient, and safer.